Up to 11 people have been killed and 40 injured following a suicide bomb attack at a Coptic Christian Cathedral in Alexandria, according to Egypt’s Health Ministry as cited by state media. 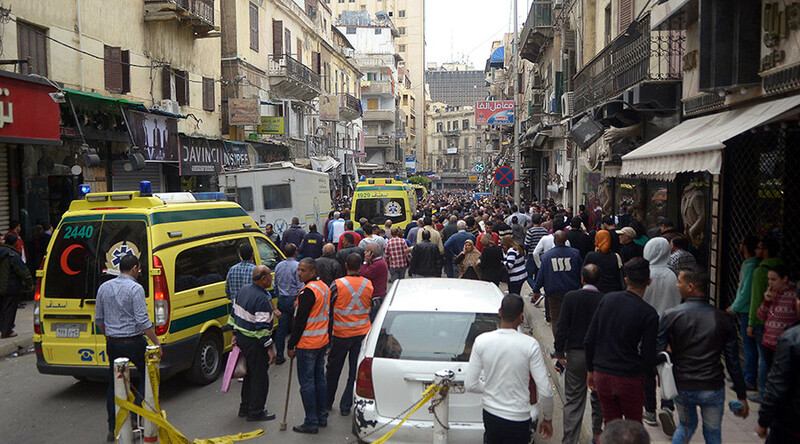 This follows another suicide bomb attack in Tanta, Egypt earlier Sunday morning. Islamic State (IS, formerly ISIS/ISIL) have claimed responsibility for both bomb attacks in Egypt. Tawadros II, Pope of Alexandria, had finished celebrating Palm Sunday mass at St. Mark’s Coptic Orthodox Cathedral and had left the scene when the explosion took place. He is reported unhurt. The Egypt Independent reported a heightened security presence and that authorities had been placed on alert in anticipation of such attacks on Palm Sunday. The attack earlier this morning at St. George’s Coptic church in Tanta, approximately 130 km (80 miles) southeast of Alexandria killed at least 21 people and injured a further 38. An image uploaded to Twitter corroborated by RT shows the scene at Al Akbat, a street adjacent to the Cathedral, following the blast. No group has claimed responsibility for either blast so far and no relation between the two has been established but these appear to be coordinated attacks, local media have reported. The US Embassy in Cairo has expressed its condolences while condemning the blasts as “heinous, reprehensible terrorist attacks”on Twitter. No group has claimed responsibility for either blast so far and no relation between the two has been established. Violence against Coptic christians has risen in recent years following the military coup in 2013. A bomb attack outside a Coptic cathedral in Cairo killed 25 and wounded 49 people in December of last year. Crowds can be seen gathered at Al Akbat Church street in video corroborated by RT uploaded to YouTube following the blast.